I recently wrote a piece on this parish for my PG Diploma, so I thought I'd summarise it here on the anniversary of Charles Dickens’ death, and also start a new "Spotlight On" feature, which I hope to add to in the future. Of course I won't be covering all of the London Parishes, as that would be too great a task. 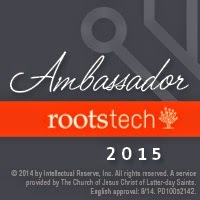 But I may invite others to write a Guest Post on a parish they know well. St George the Martyr parish lies just south of the Thames, quite close to London Bridge. It is adjacent to the other large Southwark parish, St Saviour's, and has a rather strange "boomerang" shape to it. Until 1900 the parish was technically part of Surrey, although there have always been very close links to the City of London. Indeed the parish grew substantially in the 18th century when the population of the City "overflowed" south of the river, encouraged by the arrival of new bridges over the river Thames. 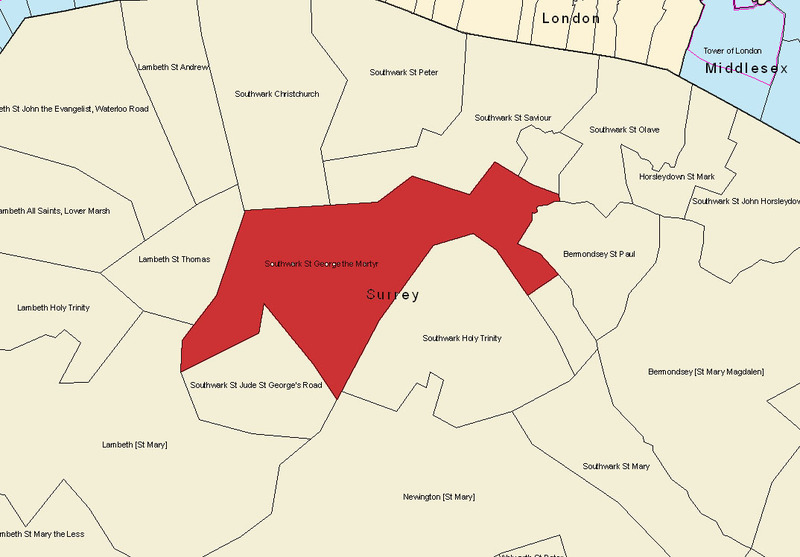 The map below shows the very unusual shape of the St George the Martyr parish, as well as the names and locations of neighbouring parishes, all of which form part of what was previously Metropolitan Surrey. 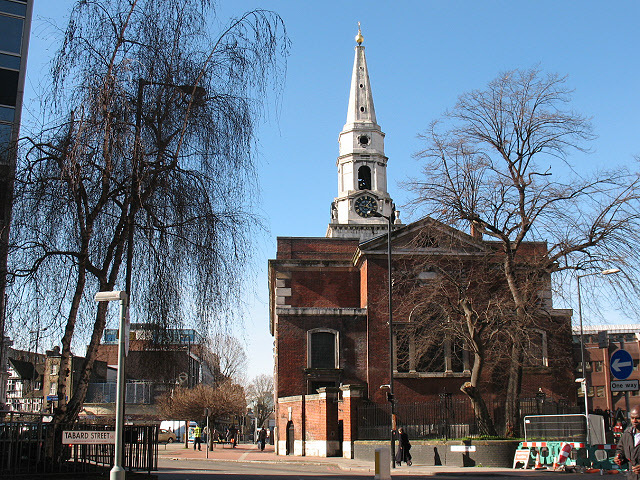 The church of St George the Martyr (pictured below) is often referred to as "Little Dorritt's church", on account of the reference in Charles Dickens' Little Dorritt to her being baptised there. This parish is in fact full of Dickens references. In Victorian times, there were two famous prisons, the King's Bench and the Marshalsea, both located in the parish. Dickens' own father was imprisoned for debt in the Marshalsea, when Charles was just twelve year's old, an experience he retold in his book, Little Dorritt. The history of the parish goes back to early medieval times, with one of the earliest mentions being when the church was given to the Bermondsey Priory in 1122. The location of the church of St George the Martyr has not changed - it was originally near the start of the pilgrimage route to Canterbury and was used by pilgrims for prayers before setting off. The church has been rebuilt a few times, most recently in 1734, although subsequent repairs were carried out following damage in both the world wars. Today the parish of St George the Martyr is merely an ecclesiastical parish; the civil parish was abandoned in 1930, having already become part of the Metropolitan Borough of Southwark in 1899. For those with ancestors who originate in this Parish, family history records are held primarily at the London Metropolitan Archives, with just a few local records held in the Southwark Local History Library. A niggling comment (you can slap me figuratively, if you like): The Marshalsea closed in 1842, so it was barely Victorian, wouldn't you say? Likewise, the King's Bench prison was renamed the Queen's Prison the same year. Thank you Suzie, for your comments. Looks like our ancestors were in this parish about the same time. Thanks for this post. My g g g grandparents Henry William Seabrook and Sarah White were married there in 1828 before emigrating to HobartbTown, Australia. Sharon, I'm glad you liked the post. Have you managed to trace your ggg grandparents any further back? 1638. his name was walter hyer II. his son walter hyer III went to the united states around 1868 and settled monmouth county new jersey. Dear Rosemary,I just found my ggg grandfather was baptised at St George the Martyr in 1802 his name was Edward Dearle your inbut and what I read on wikip. has been very exiteing. Dear Esme, I'm glad you found this post useful. I presume you have found your ancestor in the original baptism records for St Geore the Martyr, which are now online at Ancestry? I must admit I, too, found it exciting when I first found my ancestors in there too. The tricky bit, I've found, is getting further back! London Probate Records on Ancestry - coming soon?